Part of the problem, financially, is that I’m juggling three different checking accounts; two of which I don’t legally have access to. So I set it up so I can view them all online, which I think will help a lot. Prior to today I never had any clue how much was in two of them. And I’m working on a sales entry that I’ll post on Tuesday. I feel optimistic. I cand do this. I took a break from cleaning my room to work on the kitchen a little bit. I cleared off enough space to make myself a proper meal for the first time in over a week. 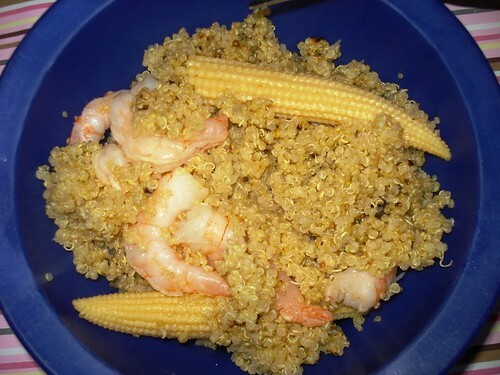 Quinoa with shrimp and baby corn. Yay for good food! And double yay for leftovers! On Wednesday I go to a planning meeting at the nursing home. I guess I’ll find out then what the future holds for my mom and, therefore, me. 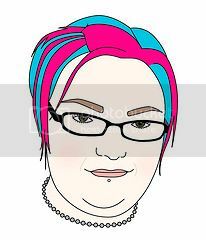 Thursday is my gynecological follow up appointment. Fingers crossed for good news. Here's a recipe suggestion: a homemade tomato sauce with only three ingredients. That looks delicious! Ahhh but I went vegetarian so no shrimp for me! Looks really delicious and healthy! You are motivating me to get my messy and completely unorganized house back into order! I'm keeping my fingers crossed for good news as well. Lyndorr that might be the easiest recipe on the planet! And it looks so tasty! I think I'm going to try it out! Jody, we can be cleaning/organizing buddies and motivate each other! God knows I could use some motivation. I haven't been brave enough to try quinoa. Of course, I don't think I'd know where to find it, either, at this point. Quinoa is amazing! I'm madly in love with it. Do you have Trader Joe's or Whole Foods around you because I know you can get it there. As someone that has in the past been on the administrative end of a long term care facility, let me give you a tip for your care meeting. Let them know EXACTLY what you want for your mom. This is not the time to be sweet or shy. Write down any questions you have, and keep asking them until you feel they've been answered fully. Get the phone numbers for the facility director as well as the unit manager if there is one. If a social worker is conducting the meeting, get their email address and phone number. Social workers at long term care facilities usually have the residents best interest at heart, and it pays to have a good relationship with them. Don't be shy to contact them on a regular basis if needed. Remember that this one meeting doesn't set anything you're not happy with in stone. Make sure you communicate frequently with her social worker. Get their email address as well as phone numbers. When you go in to visit your mom, feel free to ask her nurse any questions, and if you don't like the answer, go to the unit manager or social worker. That helps so so so much, Kimberly! Thank you for all of your help! Heidi, have they started your mom on chemotherapy yet?